We started the week off at Emerald, which is one of the TRGG’s favourite courses. Joining us today after an extended absence was a very popular Mr Toshi Aoki. Toshi only managed to score 33 points but beat both 2nd and 3rd place opponents by virtue of count backs. His popularity reached new heights when one of the girls persuaded him to ring the bell. Toshi has a very limited knowledge of the English language and thought it was a “Victory Celebration” until he was surrounded by a dozen very appreciative young ladies and everyone in the bar toasting his health! With his prize money diminished he immediately enrolled for English lessons. Tuesday’s venue was Green Valley and out of the three courses at the Barcelona complex, it’s in the best condition by far. Taking full advantage of the course conditions was Paul Sharples who set up his win with a solid nineteen points on the front nine and kept it going on the back to finish with a respectable 37 points. Paul has been knocking on the door of a win since September 2017 and finally broke through for the first time in almost a year to claim the number one spot. Wednesday we headed up the 331 to Greenwood which played host to our monthly TRGG-Ferdinand Cup competition. 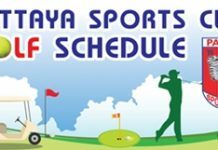 This competition is a stroke event with the monthly winners receiving double prize money, plus they qualify to compete in the final playoffs at the end of the year for a 15,000 baht first prize. 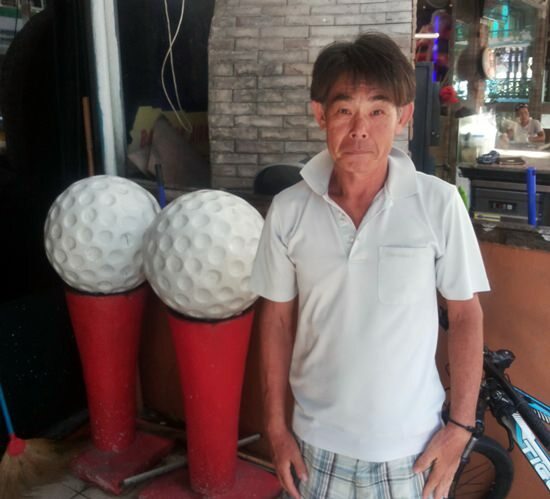 Today’s newest qualifier was our very own “Ring the Bell” Mr Toshi Aoki who scored an amazing net 68 points and went on to record his second first place finish in just three days. Toshi sat as far away as possible from the bell and no amount of seductive coercion by the girls could convince him to go anywhere near it! On Thursday we travelled back up the 331; however, this time we were headed for Pattana. Paul Sharples who having broken his drought on Tuesday and was full of confidence, literally took the course apart. With his new handicap of 14 he shot twenty points on each nine and finished the day with an unassailable 40 points. Being a “Lefty” he was quick to point out that the reason most golfers struggle with their game is that they are holding the club the wrong way? Friday at Burapha and it was time to draw the curtains on the Toshi and Paul show. Doing it in style and posting the best score of the week was the handsome, debonair, and extremely charming Mr Colin Smith who for the benefit of any ladies reading this report, is also single. Colin’s 41 points rocketed him to out and out favourite to win the Hua Hin King of the Mountain tour and the 2018 Player of the Year award. What a catch girls! Saturday and for the third time this week we were once again negotiating the 331, this time we turned off early to take the leisurely drive through the pineapple plantations to arrive at Pattavia. It was Mitch Ikeda who posted the best score of the day, negotiating the lightening quick greens with consummate ease to finish with a score of 38 points and claim his third win in two weeks.